UPDATE – 10/8/2018: This entire series was written before the podcast was to be released. Many people messaged me this morning about the format change where Peter summarized a rebuttal before the podcast begins in an unusual format change and were quite frustrated about it. Just listen to the complete episode and even return to the beginning again to judge for yourself. Again, this is and always will be a journey of science, not of advocacy. Update 2 – 10/8/2018: I now have a response piece to Peter’s prebuttal at the beginning of the podcast which you can find here. Since my earliest days, he was kind enough to answer some emails I sent him regarding my high cholesterol before I knew much about the subject. Having me on at all shows genuine interest in having the discussion. If he were truly fostering an “echo chamber” as some have suggested, then he’d only have on lipid-lowering advocates. Why bother sharing any of the megaphone with a skeptic of the overall theory? During the show, I complained at one point of the high cost for a National Lipid Association conference. After the podcast wrapped, Peter offered to cover my entry fee for one of these conferences, which is nearly a $1,000 value. This was not only very generous, it was clearly a good faith effort to expose me to higher level lipidologists in the field for the benefit of expert opinion. I ultimately decided to turn down this amazing offer. But I did so because I realized any appreciation I expressed toward Peter past that point could be seen as influenced by this gift. Or to put it another way, you can be sure everything nice I’m saying about him on this page I genuinely mean as I’m literally paying almost $1,000 to do so. I was excited to finally visit Peter’s office in San Diego. When he arrived, he had a flurry of business to take care of with his assistant, then entered the room to greet me. At first, I was concerned that I might have caught him on a bad day as I felt like my own pre-show chatter wasn’t landing very well. But I soon realized he was just in a very focused mode getting materials together in front of him for the podcast and confirming appointments to follow. He plugged in the mics and warned me I need to stay very close for optimal capture. He likewise pointed out there will be the occasional plane flying above the office. Just a hazard of the location. After some short banter, Peter set the stage well and introduced me. One of the things I wanted to be sure to remember was my being very upfront about not being a formally trained biochemist or medical professional. Everything I know is self-directed learning. The other thing I wanted to be sure to mention is a big thanks to Peter himself for providing The Straight Dope on Cholesterol series. Okay. I think the other thing we’ll want to make sure listeners have done by this point if they want to get really deep on the understanding of this is probably go back and listen to at least one but potentially two or three of the other podcasts you’ve been on. You’ve been interviewed a number of times. I’ve had the privilege of listening to several of them, which is what kind of helped me get more up to speed on some of your arguments. I think rather than just spend an hour going over those again here, I’d rather we sort of get to it more quickly, which we will, and then let the listener go back and get that way of background. I was thankful for this statement as I figured Peter was up on my general model and we could just jump into the meat of it right away. We talked about my numbers pre-keto and how I came into hearing about the term, “hyper-responder”. Anyway, I apologize. I’m talking more than I should be. Not at all. For what it’s worth, what you just mentioned … I myself have not gotten a sterol test. I haven’t actually broken down these, but I have been particularly interested in this. For what it’s worth, Peter, I’ve been looking forward to this because I think I may actually be just the stealth interviewer in the room because I think it’s just as possible I may be asking you more questions than you’re asking me. We returned for a bit to my backstory. Then I eventually worked my way around to how the research began. I spent a while discussing my theory on energy distribution through triglycerides aboard Chylomicrons (CM-TG) and aboard VLDLs (VLDL-TGs), with the latter resulting in higher LDLs downstream. IMPORTANT: If you’re not that familiar with proposed Lipid Energy Model, you might want to watch my Breckinridge 2018 presentation here. 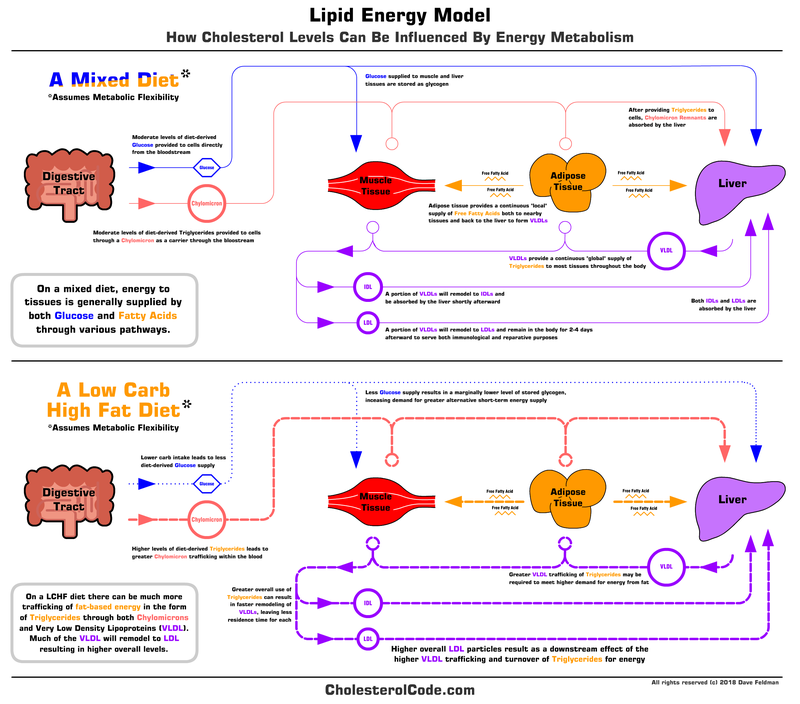 You can also check out my new diagram for the Lipid Energy Model theory here. I think we do need to get pretty technical on this because I suspect that you and I will draw different conclusions from the data. In my experience, the easiest way to understand where those differences lie is to sort of start to get into some of the things that we would view differently. I’ll start with one thing that you said … I like to be, I think, maybe clear on where I believe the chylomicron, the VLDL, the IDL, and the LDL are coming from, going, and what they’re doing. Peter then launched into a fairly straightforward view of existing literature and how it ties in the core assumption that the real value of LDL particles is as a part of the reverse cholesterol transport (RCT). We then chatted about ApoE and ApoC-III for a bit before he rounded back to my energy model. How Many LDLs Started as VLDLs? … So, you have this de novo creation of VLDLs, and you have this de novo creation of LDLs, and they form this circulating pool, but to my knowledge, we can’t really differentiate those when you look at that snapshot. I can’t tell, is that an LDL that came from a VLDL, or is that an LDL that came straight from the liver in that form? And that was actually one of the questions I had for you was how, with a kinetic study, can you actually determine if an apoB100 lipoprotein that was secreted by the liver ever has, say an APOC-II on it? I think you and I would probably be in agreement that we don’t know. We don’t have any clinical way to measure that. Right. And in that sense, I fully can see that I can’t be sure, even with the energy model, that the LDL particles that I’m seeing, the LDL-P, that I can say with any level of real confidence how many of the total proportion of those were truly for energy delivery. This is where we get into the semantics. 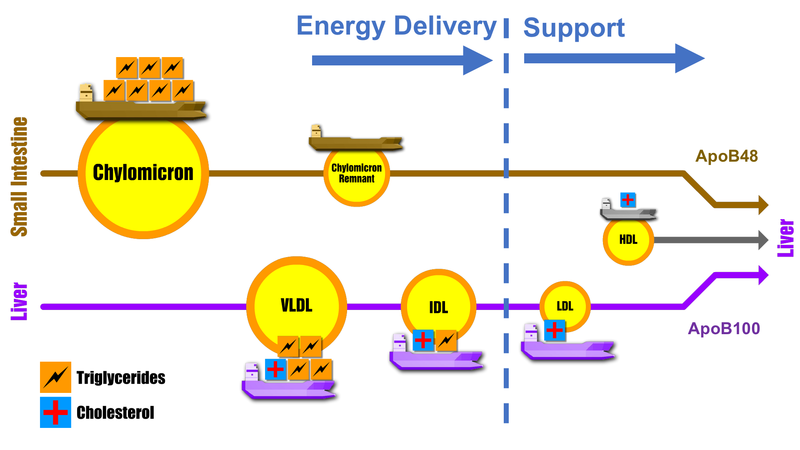 I would argue none of them are for energy delivery, because that’s not what LDL does. But I think what you mean is, how many of them came from VLDLs that were trying to deliver energy? Right, originated as VLDLs, for the purpose of doing it. In the morning, let’s say that your job is to deliver pizzas <snip> and you know that it only takes you about an hour to do. And then, guess what, the rest of the next two to four days you’re actually going to be patrolling the neighborhood. You’re the neighborhood watch. And you’re going around, and you’re also helping to fix up people’s houses, or something along those lines. Somebody who comes into the neighborhood and sees a whole bunch of these cars patrolling, they don’t know how many of those people actually delivered pizzas before they got started on that part of the shift. Here I tried to convey the “Two Jobs” description of ApoB100 lipoproteins. That a large proportion of them deliver energy first as VLDL (the pizza delivery) and then second, remodel to an LDL to take on a support role (the neighborhood watch). If you look at the pathway graphic, you see in that purple line at the bottom the representation of the ApoB100 lifecycle when beginning as a VLDL. The key is that dotted line where I distinguish the “Energy Delivery” and “Support” jobs. The critical question, of course, is just how many LDL particles did indeed start out as VLDL particles? Peter responds with Frank Sacks’ paper which details a breakdown of both VLDL and LDL secretion from the liver. Well, we sort of know. I mean, what Frank Sacks’ paper showed is if you have a triglyceride … If you take patients with low triglycerides, and I believe he used a cutoff of 130 mg per deciliter, 38 percent were de novo secreted by the liver, 62 percent came from either IDL or VLDL, where you had de novo … I don’t think the paper differentiated between which ones went IDL to LDL versus VLDL to IDL to LDL. So that’s an important point. I think at this point he’s referencing this paper from Sacks 2015, The crucial roles of apolipoproteins E and C-III in apoB lipoprotein metabolism in normolipidemia and hypertriglyceridemia. This is oft cited by Dayspring. You can dig into it to find out where they got that same percentage breakdown Peter cites and it references the earlier study, Rapid turnover of apolipoprotein C-III-containing triglyceride-rich lipoproteins contributing to the formation of LDL subfractions. To be sure, each of these papers are very technical, but I’m very, very interested in just how they determine direct secretion of LDL particles that — and this is key — would never fill the role of energy delivery as a VLDL in their lifecycle. In other words, at no time would they ever have an ApoC-II on their hull and be providing the TG cargo within to cells. The problem with trying to speculate this, even with a kinetic study, is that ApoB100s are the only apo that is “non-exchangeable”. Other apos that are attached to the surface can be provided (such as by HDL particles) and this includes the very relevant ApoC-II. This apo is how cells can specifically bind and combine with LPL to get fatty acids off the lipoprotein through hydrolysis. With that in mind, here’s what I would speculate. This is purely hypothetical, but I would speculate if you were to grab a whole bunch of people who are … We’ll hopefully get into this model that I’m talking about, that I call lean mass hyper-responders. People who are at the far end of the spectrum, they are athletic, they are thin, and they are very, very low carb, and therefore see very high levels of LDL-C and LDL-P, but they also have very high levels of HDL-C and low levels of triglycerides. I suspect that they would show a very high rate, proportionally, of VLDL secretion, that they actually are trafficking a lot more, for their energy, triglycerides in VLDL particles, and therefore have succeeding LDL particles as to the explanation as to why their LDL-C and LDL-P would be higher. Peter asked about Virta and PPAR alpha/gamma briefly, but I steered it back to LMHRs for a little while longer and discussed CIMT and CAC markers. Peter went into depth on his opinion of the limitations of these markers, then rounded into many different subjects afterward for a bit. This is one of those exchanges that I have to leave completely intact and it’s worth reading entirely. Now the good news is, today we at least have one laboratory test that can measure that burden of oxidation. It’s called the OxLDL assay. Now, this has been around for a while, but clinically we’ve only been using it for a couple of years because it turns out some very small percentage of those LDLs, once they are oxidized, escape back into the circulation. By sampling those we can track, indirectly, “Hey, what’s the likelihood that oxidative damage is happening?” For me, this is one of the most important metrics I look at is, because I want to spend some time later on going over some clinical cases. I want to see some of the data on yours. I want to show you some of the data that will explain maybe how I’m thinking about this. But this oxidized LDL, which is well documented and described in different quintiles, right, is giving you a small sample of what’s going on. But for the listener, it’s important to understand that when you get a blood test, that’s not telling you what’s happening in your artery. It’s giving you probabilities of things that are largely stochastically governed, that are going on in your artery. And the OxLDL is no exception. Even though it’s a beautiful marker, it’s still dependent on the idea that a subset of those oxidized sterols are now escaping. Can I actually ask a little more on that one? We already know that LDL particles, specifically apoB100 at the LDL stage, have alpha-tocopherol I think is how I’m saying, basically it’s vitamin E, right, as part of the antioxidant defense system. So they’re actually, I mean, part of the purpose of an LDL particle is to actually provide that as a means to battle reactive oxygen species. Right? I don’t know about that. If that were true, if it were solely true, it would make me wonder why people with LDL deficiencies wouldn’t have deficiencies of those processes as well, which to the best of my knowledge they don’t. Because I’ve actually been wanting to get into this a lot more, recently, in that … In fact, I might have the thing up. I’m not sure if I’m allowed to do this. Yeah, this is one of the papers, but I’ve actually been getting into [inaudible]. Correct me if I’m wrong, but basically, there’s a certain degree to which you’ve got vitamin E on board. On top of that you’ve got the potential of the phospholipid shell to become oxidized. So if you get oxidized phospholipids that also can bring about the role Lp(a) that can cleave off the oxidized phospholipids. That’s ultimately what Lp-PLA2 is, right? And this is also, I don’t know how much of this is actually demonstrated, but is ultimately where a lot of the concept behind why it is you would have a higher detection of small lipoproteins, particularly small LDLs, can come around to, is if you’re getting them constantly oxidized and having to constantly cleave them down to much smaller amounts. And then they constantly remodel. Yeah, but we’re getting off into two different things here. So let’s come back to this. It’s not clear to me that there is sufficient evidence to suggest that part of the role of LDL is to combat the oxidative stress. Okay. Then let’s put that as homework that we’ll catch up on after this. I actually have a lot of additional research I’ve done on this since the podcast has been recorded, but I’m going to save that for a separate blog post. But for brevity’s sake, my position is still the same. But this is relevant for whether or not we’re detecting oxidized LDLs that had never entered the intima. Right? No. The oxidized LDLs that we’re detecting have escaped the intima. There’s a very small subset that are getting out. Okay. That’s definitely something I would like to follow up, because I’m genuinely curious about this stuff, as to whether or not they can be oxidized sufficiently that they’d get big, because it also may be something that is part of the test or isn’t a part of the test, but I’d be curious as to how it can actually determine that. Yeah. What you’re basically asking is, how do we know they weren’t oxidized never inside a subepithelial space, and that’s a fair question. I don’t know the answer. I know very little about this assay. I mean, I know the technical stuff of how the assay works, like it’s an ELISA assay. I know what enzymes it’s looking at, but the broader question is, without a tracer, do we know if that LDL has actually been in the subepithelial space where it was bound, oxidized, and then escaped or liberated? So, fair question. Good, because it’s certainly relevant to this larger question of the value of LDL particles, as to whether they play an important part of the immunological role. At this point, I was starting to realize how our way of thinking this out was different. Given everything I learned to that point, I continually imagined free radicals in the bloodstream getting constant contact with LDL particles, but this was by design. Loaded up with anti-oxidants, it would be a core responsibility of LDL particles to donate those hydrogen atoms to reactive oxygen species anywhere and everywhere they could in the serum. And while I know it is anathema to say, I would likewise wonder aloud if LDL particles becoming oxidized were still preferable to the alternative (which is… anything else!) as this could help mitigate chain oxidation events. Peter brought up HDL and how he feels it is much more relevant in the support role, particularly with RCT and potentially immune defense. Interesting, but this gets back to the multipurpose value of a vehicle. Is it doing things other than that, that also turn out to be relevant. And I think this kind of gets to the larger and more important question overall. The question that I started with, going back to my November 2015 days, was I thought, very naively, that in a few days I would learn all I would need to about cholesterol and lipoproteins, find the landmark study that had a gajillion people, and it would just show that if you had lower LDL cholesterol you just died less. That was it. End of story. At first, I thought that I had found that because I had found plenty that pointed to events and pointed to a lower cardiovascular risk, but then wouldn’t necessarily talk as much about all-cause mortality. I then had to learn about all-cause mortality. And then more and more I felt like I couldn’t get to something that really emphasized … I thought for sure at least I would see, for example, an elderly population. Generally speaking, the lower your natural LDL … We can get into snips, for example, on this … the more likely it is that you would just live longer, period. But you have to remember how these studies are powered. The challenge with ACM is, I don’t think any study in the history of civilization is going to be powered to detect that. It’s hard enough to detect cardiac mortality in a study. So I think we need to be more clear in what our concern is. If the concern is, if you are less likely to die of heart disease, you are more likely to die of something else, then we should state that explicitly and say, “Hey, low LDL, while may be protective of cardiovascular disease,” I will argue that is unambiguously clear and we can discuss that. But the bigger question is, are you concerned that, well, it’s increasing the risk of cancer or a neurodegenerative disease? Yes. So the question there, that’s a question of power. It’s not uncommon in cardiovascular studies to see a reduction in coronary mortality with no change in all-cause mortality, or a non-statistical change. You know, most of the time you just don’t see a change, or it’s a change that’s very slight. And then you have to ask yourself the question, even if it looks, hey, death went up or down of other causes, you have to go back and ask yourself, “Was the study actually able to detect that?” That’s a very hard thing to detect. First, do high levels of LDL particles have any positive outcomes of any kind? I would argue yes, there is quite a bit of evidence linking lower non-CVD mortality to higher levels of LDL (as mentioned earlier). Which leads us back to the “trade-off” question. Let’s assume for the sake of argument that the Lipid Hypothesis is 100% correct. Would it be possible for mortality reductions by non-CVD outcomes to outweigh the increase to CVD itself? Of course it’s possible. So how do you know when controlling for all other risk factors that someone’s chance of dying by a heart attack is a greater chance of dying overall? You can’t without accounting for death overall. And this is a serious problem with any study that makes a claim on mortality of one type without knowing the balance. That balance, “death by any cause”, is known as All-Cause Mortality (ACM). Second, why wouldn’t you always capture All-Cause Mortality? This is Peter’s point, and for that matter, the constant point of the medical community. To “power” a study to show this difference in mortality, one needs to see a “statistical significance” which is hard if mortality changes are very, very small between the intervention and control groups. It takes more time and expense to accomplish this. So it is commonly argued that we should just assume a net benefit. However, I find this a very unconvincing position. If I tell you a pill a will reduce your chance of dying by Disease X, but it increases your chances of dying by non-Disease X causes, then I’m creating a false sense of security, even if I didn’t mean to. But it gets worse. You see, by definition, an increase in death by non-Disease X necessarily means you will reduce your chance of death by Disease X. My simple illustration is the fictitious “Cyanide Diet” where I joke that it will “reduce your chance of dying by heart disease by 99.999999%. In fact, it will have the same reduction with all other major diseases as well, like infection, autoimmune, Alzheimer’s…” Naturally, if something kills you first, other things can’t kill you later. All joking aside, this is easily detected by having the balance sheet of overall death: All-Cause Mortality. So yes, I freely acknowledge it takes more money and time to power a study for all-cause mortality, particularly if the margin of difference is small. But so what? Why is medicine, of all places, an area where we wouldn’t want to know the statistically significant risk of all mortality for anything that makes a claim of mortality benefit? I brought up how I didn’t feel a lot of confidence in these drug trials given the short time horizon (“two or three years”) relative to the total time it takes to build atherosclerotic plaque (years to decades). Peter talked for a bit about his strong opinion regarding PCSK9 inhibitors and getting into debates online. Of subjects I wanted to talk about that day, PCSK9 wasn’t really one of them. But near the end, we got into the time to exposure question. So, coming back to this thing about lifetime exposure, this is where the Mendelian randomization becomes a very important tool in understanding LDL’s causality. What you alluded to at the outset, you are correct in noting is deficient. There is no lifetime study where, without a drug, you can prospectively manipulate LDL and follow people for 100 years and determine outcomes. That would be the ideal study. Right? Yeah, that would be. You actually, you talked about this in the [series with use] of the wand. I know, I remember sort of going on … That’s right, the magic wand test. Well, we have natural experiments, right? We can look at the abetalipoproteinemia patients who can’t traffic cholesterol, therefore they would be entirely dependent on their own cellular endogenous production and they seem completely fine. So that’s not proof, because we don’t have proof to your point, but it’s certainly evidence to suggest … I mean, we also know when that’s off. Right? Because the abetalipoproteinemia patients, in theory, should be the ones who are outliving us all. Right? They can take out the whole component of heart disease, of atherosclerotic plaque, everything. They should have massive longevity, relatively speaking, to everybody else. So the ones who get the longevity, because there’s only about 12 genes that are well enough studied, we have enough patients that we think we know something. And the most important of the longevity genes in cardiac is the hypo-functioning APOC-IIIs. Yeah. Work out of Albert Einstein has identified these, roughly a dozen, genes. And the hypo-functioning APOC-IIIs are, I mean most of those genes are, you know, like GHR, IGF. ApoE would be one, right, so ApoE2 would carry with it protective benefits in terms of longevity, both cardiac and, but more that is neurodegenerative. But it’s those C3s. In fact, as we have kind of alluded to a couple of times, I believe there’s an antisense oligonucleotide (ASO) in clinical trials now, trying to impair APOC-III, so now it’s becoming a therapeutic target. After this podcast, I went back to do more research finding where either ABL and FHBL might result in a net longevity (AKA, lower all cause mortality) with very little luck. The best positive study I was able to find involved a handful of elderly in their 90s and 100s from three families in Spain. It’s a bit scattershot in trying to triangulate the specific SNPs associated but manages to find some with reduced ApoB. Unfortunately, they excluded out many alleles by design and it’s unclear if they likewise looked at SNPs that increased LDL as well. Moreover, there were no blood tests for further comparison to their genetic data. However, the negative studies were quite numerous for both ABL and FHBL. Remember how I was discussing a potential “trade off”? This certainly seems to be the case for many who are genetically prone to very low LDL. Many studies detail how ABL and FHBL can suffer severe deficiencies in fat-soluble vitamins A and E (which are brought to cells in lipoproteins), which requires high dose supplementation “to prevent or at least slow the progression of neuromuscular and retinal degenerative disease” among other issues. I found a reference to the research Peter was discussing here in an article with the headline, “Apolipoprotein C-III gene associated with longevity” which detailed “a team from Albert Einstein College of Medicine has identified a second longevity gene occurring more frequently in people who live to 100 years of age.” This linked directly to the study, Genetics, lifestyle and longevity: Lessons from centenarians. In the abstract of this paper, it mentions, “APOC3 –641C allele is associated with a favorable lipoprotein profile, cardiovascular health, insulin sensitivity, and longevity.” To be sure, I was instantly disappointed this was associated with both “favorable profile” and “insulin sensitivity”, the latter being well known for its association with longevity. The sciency me wants to get that clean variable without others muddying up the Outcome Waters. But it gets more interesting… the “favorable lipoprotein profile” isn’t actually about lower LDL cholesterol. Relationships between other lipoprotein traits and APOC3–641 CC genotype are shown in Table 1. Due to the dependency of lipoprotein traits on age and their modifiability with medications, we only considered offspring (n = 131) and controls (n = 126) not using lipid lowering drugs in this analysis. In females, triglycerides (TG), high density lipoprotein cholesterol (HDL), and their ratio, as well as low density lipoprotein cholesterol (LDL) lipoprotein particle size were significantly more favorable among those with the CC genotype compared to the CA/AA genotypes. The same trends were observed in most of the associations in men. So this was about LDL size, not quantity? Take special note of the very high HDL and TG/HDL ratio (both of which are typically improved on a low carb diet). But notice the LDL cholesterol — something I thought would be low given the higher clearance rate assumed with lower overall ApoC-III. Yet all the averages for LDL-C are above 100 mg/dL, with the women even averaging an LDL of 129 for CC and 134 for CA/AA. Comments are disabled for this post. Please skip to the last blog post to comment on this series.